Good kitchen interior designs aren’t necessarily exclusive to large kitchens, designed by famous interior designers. You can design one yourself if you have the big picture on your mind and a few good kitchen design ideas that will help you keep your small kitchen area well-functional, organized and beautiful. Before we get started it is important to remember that a good home kitchen design has the right combination of functionality and beauty. Clean lines, efficient, durable materials and modern aesthetics are what you need to get that perfect small kitchen for your home. In this blog, we will talk about 7 kitchen design and décor ideas, something for everyone, some of them luxurious while others for people who love simple kitchen designs. Let’s get started, shall we? Love the idea of an eat-in kitchen but a large dining table just won’t fit in your small kitchen area? Try a drop-leaf dining table, ideal kitchen design for small spaces. They are truly Godsend and thanks to the hinged flaps that can be flipped up when you have an extra guest drop in. They can also be tucked in without any hassle when not in use. Additionally, the center of the table can be used at all times to serve as an extra prep space. Nothing makes a small kitchen feel more claustrophobic and cramped than poor lighting. A few under-cabinet lights go a long way in making your tiny kitchen more workable, functional and brighter. Hate to try open shelving because dusting scares you away? Kitchen cabinets not only take up more space in a small kitchen but also limit space usage whereas open shelves do come with the possibility of increasing your storage options. It helps to make the small space look open and airy. Open shelves are actually easy to organize and are inexpensive. Install them and flaunt your pretty dishware. Banquettes are ideal for cramped areas and make the most of the often unused spaces. These maximize seating options and the storage space beneath the benches provides ample space to store away serving platters, table linens and other dining accessories. A collection of comfy throw pillows makes the seating area comfortable and inviting. Pull out drawers are your answer to a cleaner, neater and more organized storage solution for your small kitchen. 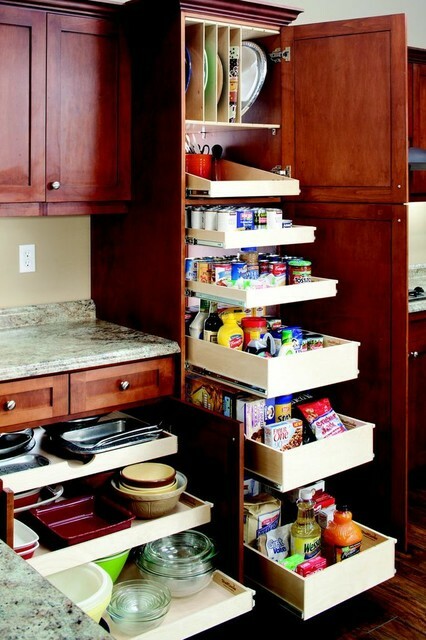 Include pull out drawers in your kitchen cupboard designs list to create an efficient storage space. Install several tiers of drawers and fit all your cooking accouterments without going crazy. Make good use of an empty corner with a wall mounted cabinet and transform the area into a valuable storage space. Conveniently store away canned good, spices and so much more. Make open shelving work harder by fixing cup hooks to the underside. Not only do mugs look lovely displayed this way, but you’ll also free up cupboard space for other things. Themed Modular Kitchen Designs – The Latest Home Décor Buzz! Trendy and super-cool,coffee kitchens are the latest fad that offers you a refreshing experience while you cook. A favourite of the coffee lovers or otherwise, this kitchen interior design is all about the dark panels and the wood finishes against light or pale yellow back splashes, accessorized by coffee mug displays, coffee quote posters and interesting themed décor such as candles nestled smugly inside a bowl full of coffee beans. Super trendy, it’s a corner of your house that your friends will surely love! For the young and the fun loving, who want to make a cooking experience feel like a holiday, we have the beach themed Modular Kitchen Design complete with the aqua blues, the bluish greens, the white and the pale yellow hues all combined in a tranquil as well as exotic combo of cabinets, counter tops, backs plashes and centre islands for you to choose from. A strip of dolphin tiles, a few star fishes strewn here and there and voila! A perfect tranquil getaway while you cook! For the adventurous few, a modular kitchen theme that’s become very popular is the barn yard look…the complete rustic and homely corner to chill and cook and of course impress guests with! The favourite colour here is the typical ‘barn red’ – to be used as ascent wherever possible. To top it off, having animal decorating pieces such as hens, pigs, etc as wall hangings or motifs on pottery, coupled with rustic looking pots, pans & dishes work together magically to create the barn look and feel. Posted on April 22, 2015 June 25, 2016 Categories Modular KitchenTags kitchen design, kitchen design ideas, modular kitchen, modular kitchen cabinet, modular kitchen designsLeave a comment on Themed Modular Kitchen Designs – The Latest Home Décor Buzz! Catchy Cook Spaces – The Top 3Trending Modular Kitchen Cabinet Colour combos this Season! So you have just moved into this snazzy new apartment of yours, and you want to use that dash of colour in your Modular Kitchen Design to make a style statement. Well, not a bad idea at all…apart from the fact that you are going crazy choosing the perfect colour scheme for it! So, to make your life a bit easier, here goes…the Top 3 Modular Kitchen Colour Combos that are trending this season, for you to choose from! The latest trend in creating a catchy cook space – Using two shades of the same colour! If you have a large open modular kitchen design, use a bold blue for your central island cabinets and thereafter work towards a sky blue hue for other cabinets on the outer perimeter of the wall. Set off against a white background, this colour combo will be both serene as well as modern. One of the most dramatic shade combo this season, this is sure to turn eyeballs and make a statement amidst your circle. Black cabinets at the background with a bright red island at the centre, balanced with light coloured countertop & backsplash is definitely the way to go! Third on our list is this ultra-modern modular kitchen cabinet colour scheme that lets the neutral grey come alive with the fiery intense orange at the foreground. Having a few open shelves and painting the backs of them with a lighter version of the same grey gives an illusion of depth. So what are you waiting for, choose the trend that suits your modular kitchen design the best, and let Mobel do the rest! Posted on April 16, 2015 June 25, 2016 Categories Modular KitchenTags kitchen design, kitchen design ideas, kitchen interior design, modular kitchen, modular kitchen cabinet, modular kitchen designsLeave a comment on Catchy Cook Spaces – The Top 3Trending Modular Kitchen Cabinet Colour combos this Season! These days, the sizes of homes are getting smaller day by day and as a result, the space concerns for kitchens have become really important. As the kitchen is the only area where home dwellers spend most of the time while being at home, thus it needs to be roomy and hygienic as well to keep up both health and well being of the residents. The necessity for limited spaces in the flats or homes has contributed to the emergence of modern kitchens. With the evolution of modular kitchen designs offered by mobel homestore, it has become possible to bring out a huge change in the way which the kitchen appears. Therefore, more and more homeowners are now replacing their traditional kitchens with the elegant and sophisticated kitchens. With the incorporation of different stylish kitchen design ideas like cabinets, storage facilities and some other types of modern accessories, the modular kitchens are bringing convenience and comfort to the homemakers in various ways. As a result, the conventional kitchens are fading away from the modern lifestyle. The hobs or cooking ranges, which can be fixed into the granite countertops. So, the modular kitchen designs India is the ideal solution for every home with limited space. Besides, here different types of designs and varieties can be integrated or disintegrated quite easily. Another great thing about these kitchens is that these are very durable and therefore last for a really long time. The modular kitchens can be fitted with different types of accessories to make these kitchens more modern, more sophisticated and well equipped. The accessories like the sleek glass work, elegant fittings, trendy wood finishes joined with some latest gadgets. Besides, it is also really easy to install these accessories as most of the fittings are ready made. These kitchen accessories last for a really long period in case they are bought from any authentic dealer. A complete range of designs and colors are found in this type of kitchen design. Besides, it is also possible to lay these designs in various ways to broaden the shape and style of entire kitchen space. The most popularly used kitchen shapes are L shape and U shape ones. Different types of stylish and chic hardware like vibrant colored doors, stainless steel doorknobs etc. can also be included in this type of kitchens even in case of the modular small kitchen design.